The Wilding Festival 2013 13th – 16th June 2013 The Wilding Festival was a multi-arts festival marking 100 years since the death of suffragette Emily Wilding Davison curated by Soundcastle in partnership with the Museum of London and St George’s Bloomsbury. 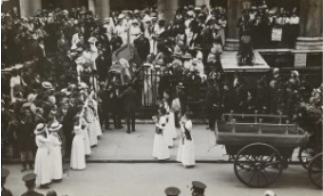 The Inspiration On the 14th June 1913, 6000 women dressed in white marched through the streets of London to pay their respects to Emily Wilding Davison at St George’s Church, Bloomsbury. This young woman lost her life in a dramatic act of protest when she placed herself in the path of the King’s horse to highlight the cause of women’s suffrage. 100 years later Soundcastle marked this important anniversary with an eclectic and provocative programme of new art works and performances inviting our audiences to experience, consider and challenge the resonance of Emily’s legacy in our modern lives. This was a festival about equality, protest and hope. Wherever you stand on the issues, everyone has something to take away from Emily Wilding Davison’s story. By displaying a wide and varied range of brand new art works and presentations Soundcastle aimed to provide an inspiring environment for people inviting discussion, reflection and discovery. To see a short film about The Wilding Festival, click here For more information about Soundcastle & The Wilding Festival, go to www.soundcastle.co.uk/the-wilding-festival-2013/ ______________________________________________________________ ACOUSTIC ARCHITECTURE June, July & September 2012 Following four successful performances of Acoustic Architecture 2011, a site-specific musical celebration of St. George’s Bloomsbury, St George’s Bloomsbury Associate Artists Soundcastle invited local school children to come and explore this special space. 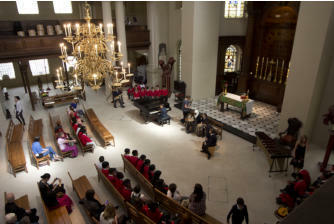 Filling the building with young musicians from St. Clement Danes and St. George the Martyr Primary Schools, the church became a hive of activity and the setting for a unique celebration of acoustics and architecture. 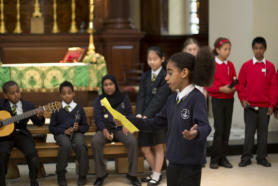 Combining the Music, Religious Education, History and Science Key Stage 2 curriculums, Soundcastle worked with the students over a five week series of workshops in which the students learned to understand what sound is and experience it in action by creating music especially for the booming acoustic of the church. By spending most of the project at the church, the students had time to build a sense of identity and belonging with their local architectural heritage, establishing a personal connection with the site. 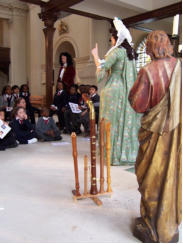 Building on composition and performance skills, students devised music collaboratively in direct response to the historical stories, the sacred atmosphere and of course the booming acoustic! 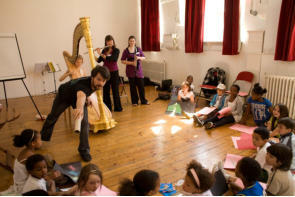 As well as enriching the current school curriculum, Soundcastle education projects such as this promote interpersonal and social skills through a creative process. 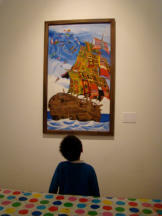 Team building, creative thinking and leadership skills are key elements in the students’ artistic journey. 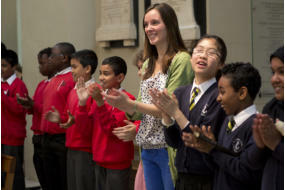 The students reveal their great depth of imagination, musical skill and collaboration. With compositional themes such as Gin Lane, The Lion and the Unicorn and St. George and the Dragon, Acoustic Architecture Schools 2012 certainly impressed! The final joint performance at St. George’s brought both schools together in a celebration of their combined creativity, new friendships and their local heritage. Catch up on the Acoustic Architecture Schools blog, including audio clips of the music created, here. 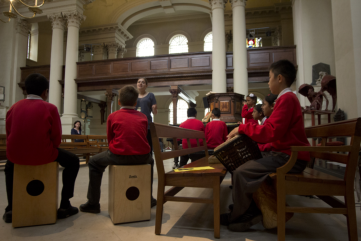 St George’s Bloomsbury and Soundcastle would like to thank the St Giles-in-the-Fields and William Shelton Charity for their generous support of this project. ______________________________________________________________ BAROQUE IDOL April 2011 Baroque Idol is a fun ongoing project created and performed by our Associate Artists Spirituoso to provide a glimpse of the day-to-day life of an aristocratic child in the Georgian era of Hawksmoor's time. 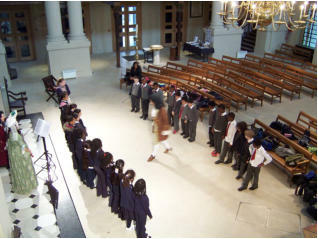 On April 1st St George's Bloomsbury provided the perfect 18th Century backdrop for this exciting, innovative and unique educational project, as 56 Year 3 children from St Aloysius Junior School and St Dominic’s Primary School were introduced to Hawksmoor himself, as well as to a musician and a very strict dancing master, to learn the latest trends of a true 18th-century celebrity fashionista! The activities of the day started with learning about the history of the St George’s Bloomsbury and features pertaining to Hawksmoor, with an architectural treasure hunt around the church. This was followed by lessons in Baroque etiquette, costumes & fashion, including how to stand, sit and bow, and the secret language of fans and beauty spots! After looking at 18th Century instruments and dancing a few steps to the Minuet, the workshops culminated in learning an entire Georgian Country dance before the children were each given a copy of our in-house newspaper the Bloomsbury Echo from January 1730 to read and discuss in class. _______________________________________________________________ ACROSS BOUNDARIES October 2010 This project was created in collaboration with the October Gallery and revolved around an exhibition of Benin artist Julian Sinzogan. 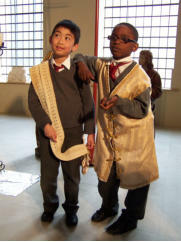 Sinzogan’s powerful and beautiful work centres on African slavery and offers a message of redemption and healing. By exploring the visible world that we inhabit and the invisible world of the spirit ancestors, Sinzogan pictures the ports of West Africa not as sites of potential loss, but as the arrival point for the homeward return of lost spirits. 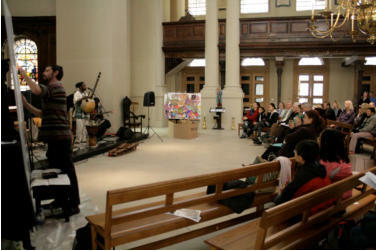 St George’s Bloomsbury’s role as an abolitionist church in the 18th & early 19th Centuries was a catalyst for creative workshops with 44 children from St Alban’s Primary School and Refugee Youth Arts from the PAN Intercultural Arts programme. 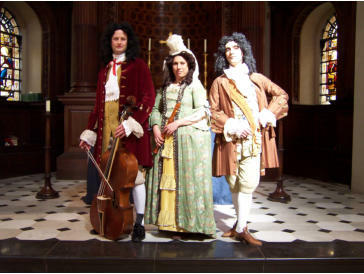 A pilot workshop was held on June 3rd 2010 with members of the Orsino Ensemble. 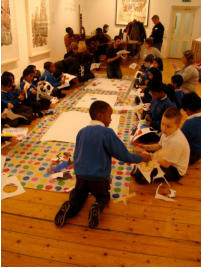 In October 2010 the full creative workshops took place in conjunction with the Bloomsbury Festival, London Big Draw and Black History Month. The participants took inspiration from Julien Sinzogan's Spirit Worlds and the imaginative improvisatory skills of artist Galen Wainwright and West African musicians from Mosi Conde’s Kaira Kora Afrika! We ran a series of music and drawing based events, exploring heritage, contemporary and cross-cultural music and art, community identity and responsibility in a global context. 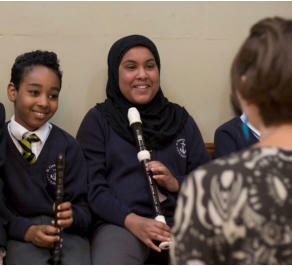 In each 2 hour session the participants were introduced to specific instruments in the music group, the music being a mixture of instrumental improvisation and songs. Co-led by Galen and the musicians, the participants then partook in a series of activities that allow them to make visual representations of the sounds and words. 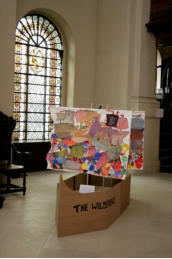 The whole group then painted their own contributions to a joint canvas that became the sails of a ship (in the style of Julian Sinzogan) that we named the SS Wilberforce after abolitionist William Wilberforce. On 23rd October 236 people - including 43 children - from a wide range of backgrounds and age groups visited the Music & Art Tea Party drop in day. 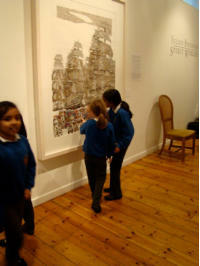 Many of the St Albans children visited the gallery with their parents to look at the work that they had helped create and to participate further in events that day. As well as tourists who were attending the Bloomsbury Festival, many of the other adult visitors were from the local community. A concert of Mosi Conde and his dynamic band Kora Kaira Afrika! on Sunday October 24th had the audience of over 100 members literally on their feet dancing in the church - a wonderful sight! We are indebted to the John Lyons Charity for their generous assistance in supporting this project. _________________________________________________________________ CD ROM St George’s has produced a CD Rom (£5) covering 1,000 yrs of Bloomsbury history with ideas for discussions and lesson plans. Suitable for KS2 + Please contact us if you would like to purchase any copies (see Contact page).